Choose from 6 private suites/rooms and 2 shared suite/room. Our Sweet Spot Retreat headquarters is a lovely 5-bedroom, 3,300-square-foot home in the heart of the rural winegrower's village of Roquebrun. Once a store for wine belonging to one of the main wine estates of the village, this home has been lovingly refurbished into a beautiful, spacious home with a small detached cottage annexe. The style of the house is reminiscent of a Provencal-style farm house -- a rare find in the Languedoc. It has the style and authenticity of "real France", combined with all the modern appliances required for a relaxing and comfortable experience. The lounge has a comfortable soft seating area for ten people and a large dining area. The fully-equipped kitchen leads out onto the pool and barbeque area -- with seating for ten people to dine alfresco. There are five spacious bedroom suites, one shared occupancy, four private -- all with ensuite bath/shower/toilet rooms. The private master bedroom suite opens onto a large balcony with uninterrupted views of Roquebrun's Mediterranean Garden and medieval tower. The other bedroom suites in the main house are all light and airy with calm views of the river and garden. One double bedroom suite leads off the salon and enjoys its own access to the garden via French doors. An additional bedroom suite is situated in the small adjacent cottage annexe. The other 3 suites are on the second floor. The house is fully furnished with a stylish mixture of antique brocante and modern furniture together with up to date comforts. All rooms have heating and air conditioning. The house has a huge open-plan living room/dining room/kitchen looking out over the garden and an 800-square-foot pool. There are three sets of double French doors opening directly onto the garden and terrace. The tranquil walled garden is a spectacular feature with year-round sunshine from Roquebrun's micro-climate. There's plenty of shade for respite from the liquid-golden Mediterranean sunlight, provided by the 200-year-old pine and the olive and mimosa trees. Part of the garden is laid to lawn. Oleander, vine, lemon and rose bushes provide colour and interest around the ancient chapel in the walled garden which belongs to one the oldest wine-growing families in the village. The amenities of the village are within a block or two: shops, tourist office, restaurants, river swimming and canoeing and yet when you close the garden gate you enter our own oasis of calm and privacy. This space offers everything we'll need in one of France's most beautiful villages... the village I get to call "home". Additional retreat lodging is provided in a stylishly-renovated and very pleasant house on the edge of the village. This house is a 7-minute walk to the main retreat house. Enjoy the charming garden and two terraces which boast breathtaking panoramic views of the old village, the river, the Roman bridge, and the mountains. The 1200-square-foot house sleeps 4 in 3 bedrooms, 2 bathrooms and 2 WCs. 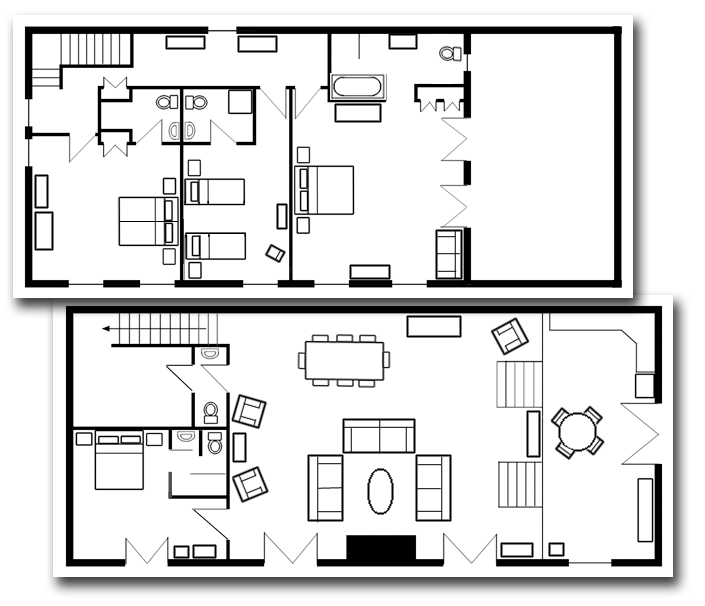 Two of the bedrooms are private/single occupancy; the third bedroom is shared/double occupancy. The ground floor consists of a spacious open-plan kitchen/living room/dining room. All rooms have French windows overlooking the river and the old village. The house is furnished with a mix of antique, brocante, and new. A classic and cosy Godin wood stove on the main floor supplements the electric wall radiators throughout the house. The 350-square-foot southwest-facing terrace is equipped with sun loungers and a large teak table. The kitchen features a French door which opens to the large terrace with its gorgeous views over the Orb Valley and Roquebrun. Higher up, the sloping little garden full of oleanders and other Mediterranean plants, there's a second, smaller, terrace. A lovely spot to relax, enjoy the stunning view or read a book. This house is a 5-minute walk to the center of the village with its various amenities and its informal social hub, l'Orangerie, a friendly village shop owned by the charming Delphine and Yannick. L'Orangerie is a heaven of sorts -- a bread and pastry bakery, outdoor cafe, coffee shop/teahouse, and gelato shop -- all in one! You're also half a block to a sweet little semi-private beach on the river Orb. © 2012-2019 The Sweet Spot. All rights reserved. ​Site design by Claire O'Connor.